The greater horseshoe bat is one of Britain's largest, found in Southwest England and South Wales. It is also found in North Africa and Asia. The species is known for its unique mouth structure and monogamous mating habits. The greater horseshoe bat population is declining, making conservation efforts a priority. There are approximately 100 species of horseshoe bats which belong to the Rhinolophus genus. The single species of greater horseshoe bats, or Rhinolophus ferrumequinum, is the largest species of horseshoe bats, who get their names from the facial flesh that resembles the horseshoe. The greater horseshoe bat's name precisely describes the animal's most distinct characteristic. The species' "horseshoe" is the U-shaped structure surrounding the bat's nose. Also called a noseleaf, this fleshy facial feature enhances echolocation, a process that the bat uses to navigate distance and locate prey. 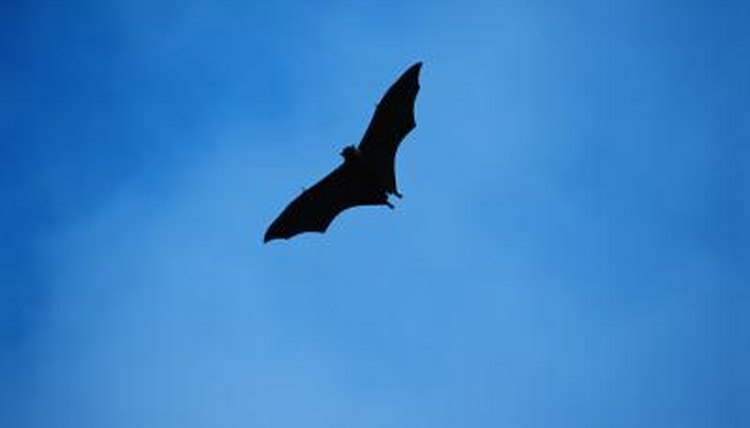 The bat makes noises that vibrate and amplify through the nostrils and off the noseleaf, then travels and bounce off surrounding objects, giving the bat direction and leading it to insects to eat. The greater horseshoe bat earned the title of greater because it is larger than other species of horseshoe bats, which are sometimes called lesser horseshoe bats. The greater horseshoe bat weighs up to 34 grams or about 1.2 ounces, and has a body length of 58 to 70 millimeters or 2.3 to 2.7 inches. This is considerably larger than the lesser horseshoe bats, who may weigh only 5 to 9 grams, or about one-third of an ounce with a body length of 35 to 45 millimeters or approximately 1 1/2 to 2 inches. Few species of bats practice fidelity when it comes to mating, but some female greater horseshoe bats return to the same male season after season within polygamous colonies. Observed colonies with tagged female greater horseshoe bats have proven that many females mate with the same male during several mating seasons. After a 75 day gestation period, the female horseshoe bat gives birth to one baby bat while hanging upside down and catches her offspring in her wings. Greater horseshoe bats are declining in numbers in all regions where they dwell. The population has decreased up to 90 percent in a century. Increasing human populations, urbanized forests and pastures, and a decreased food supply as the result of insecticides are possible causes of the species' declining numbers. Throughout much of Europe, the species is protected by law and its habitats monitored and conserved. In recent years, greater horseshoe bats have become prevalent on organic farms because of the natural, pesticide-free environment afforded.